Hide IP Platinum is the software you are looking for! Keeping your privacy is simple and easy: the only thing you need to do is open Hide IP. 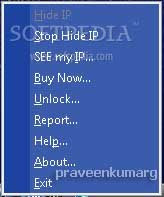 Hide IP will find the proxy server available to you and set it as your proxy server automatically. There is nothing need you to concern. Hide IP have done everything for you!